EAST LANSING – Welcome to the rivalry, Drew DeRidder. 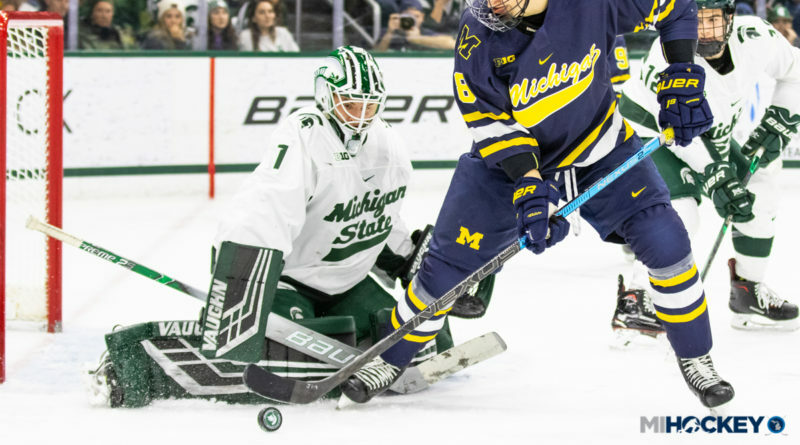 Michigan State’s freshman goaltender made his first start in the storied rivalry between Michigan State and Michigan Friday night, and he recorded his second NCAA victory at the end of the contest. It took 43 saves from the Fenton native and USA Hockey’s National Team Development Program alum, who was the game’s first star in the Spartans’ 4-3 win over No. 14 Michigan. What was his first taste of the rivalry like? Eighteen of those saves came in a seesaw third period, as Cody Milan’s goal 1:05 into the final frame to give MSU a 3-2 lead was erased by Nick Pastujov just 1:32 later. DeRidder kept the tie intact until Mitch Lewandowski scored at the halfway point of the third to give the Spartans another lead – this time one they wouldn’t relinquish. Brody Stevens and Tommy Miller also scored in the win for Michigan State; the Spartans improve to 6-7 on the season and 2-3-0-0 in Big Ten play. Josh Norris and Jack Becker scored goals to go alongside Pastujov’s for Michigan – the Wolverines are now 6-6-2 and 2-3-2-1 in the Big Ten. Hayden Lavigne made the start between the pipes for Michigan, stopping 25 shots in the contest. For DeRidder, it’s his second-straight win, and second-straight win against a Big Ten foe. Last Saturday, he made 28 saves to help Michigan State beat Minnesota on the road for his first career college win. When asked about his goalie’s performance, Michigan State coach Danton Cole talked about how DeRidder handled what could have been an early disaster for the Spartans. Norris’ aforementioned goal came on a power play just 3:04 into the contest; the Wolverines’ star forward’s shot hit Jerad Rosburg and fooled DeRidder in the process. Cole said his young goaltender and the rest of the team are learning lessons as they go. He credited last weekend’s win at Minnesota in helping MSU navigate the rivalry game Friday night at Munn – while pointing out that there is still a lot of work to be done. The series now shifts to Ann Arbor; Michigan plays host for the second night of the rivalry weekend. Puck drops at 7:30 p.m. at Yost Ice Arena in what the Wolverines are hoping to be a ‘Maize Out’ sea of yellow in the stands.